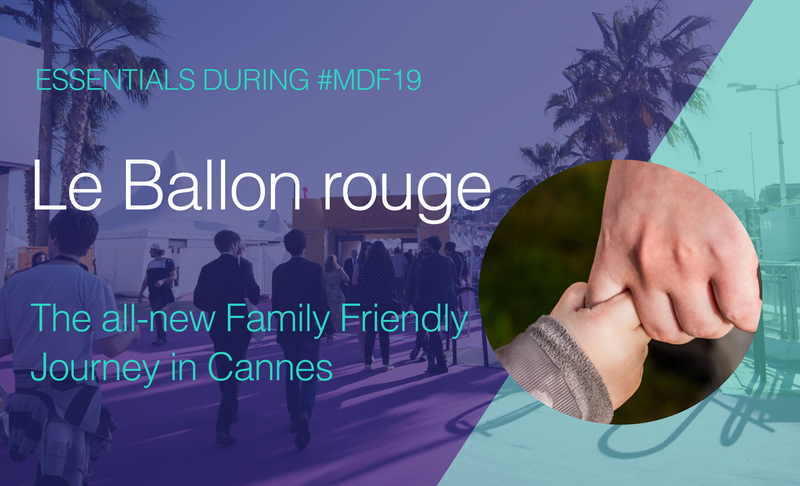 The Festival de Cannes and the Marché du Film, in collaboration with the newly-formed collective Parenting at Film Festivals, is launching an unprecedented and ground-breaking family-friendly festival journey, Le Ballon Rouge, where Children are the New VIPs. Work-life balance is a constant challenge for parents in modern society. In the film industry it is a daily battle. A vast majority of film professionals must travel regularly to film festivals and markets, sometimes with their babies and young children, and may have have a tough time combining their family and professional priorities. So often, it is just easier to leave the children at home, or more drastically, they may feel forced to make a decision between their career and the prospect of starting a family. Family-Friendly Accreditation Process: Film professionals travelling with babies and young children will have a special accreditation in order to access the dedicated services the Marché is providing, including the Pantiero’s Kids Pavilion and the Palais’ Change & Feeding Corner, as well as two additional badges for nanny + baby (free of charge). Cinando will host on its site the newly-created group Parenting at Film Festivals to better identify the community and its needs. Le Ballon Rouge Kids Pavilion: located at the Village International Pantiero, this 25m2 tent with terrace will welcome families from 10:00- 18:00 daily from May 14 to 21. There, parents can choose to either spend time with their children, have family-friendly meetings in dedicated areas, or leave their children for up to 6 hours in the care of professional nannies provided by a specialised company. This special service will be offered by a cluster of partners - full list of partners below in How was this set up?. A small compensation will be asked to parents wishing to benefit from this service. Baby Lounge Express-Changing & Feeding Corner: a dedicated room for parents and carers for breastfeeding, feeding or nappy-changing, will be open from 9:00-18:30 daily from May 14 to 25 in the Palais des Festivals. Easy Access: priority access to the Marché will be given to parents entering with children at the Palais’ main entrance, Riviera entrance and Pantiero entrance. As the stroller approaches with its dedicated Ballon Rouge flag, staff will help them through security. Le Ballon Rouge Baby VIP Kit: in collaboration with Parenting at Film Festivals and Cinando, a dedicated bag for children will be offered, with family-friendly map and services in Cannes, Marché access flag, list of certified nannies for after-hours care, and other helpful items. How was this set up? The Marché du Film has invested in the necessary infrastructure for this project and Parenting at Film Festivals raised the budget of the Kids Pavilion childcare service through an express crowdfunding campaign. More than 12 companies and institutions immediately contributed to this endeavour with financial support: Unifrance, Cinando, EAVE, Wolf Kino, The Film Agency, Pyramide, Madman Entertainment, ADEF, Europa International, Film Constellation, Charades and Pathé. Further, Raising Films and 5050X2020 have provided support and advice to Parenting at Film Festivals to make this important initiative a reality. Born out of the struggle of a group of 3 young festival-travelling mothers, the group Parenting at Film Festivals was created in January 2019 to share babysitting tips and costs, create a tribe to support each other around the globe, arrange playdates and advocate for family-friendly services at festivals and markets. It was co-founded by film programmers Aurélie Godet and Michelle Carey, and Sarah Calderón, director of The Film Agency.